3D visualization of 3DsMax VRay. House in the American style. Https://www.houzz.ru/projects/2478185/dom-v-amerikanskom-stile The interior design of an open area of ​​the first floor, comprising a living room, a staircase, a kitchen, a dining room, a corridor. The main idea of ​​the color scheme is a gray-brown scale in decoration and furniture, fresh contrasting combinations plus bright accessories and flowers. The perimeter of the walls is decorated with wooden decoration and profiles made of white MDF. 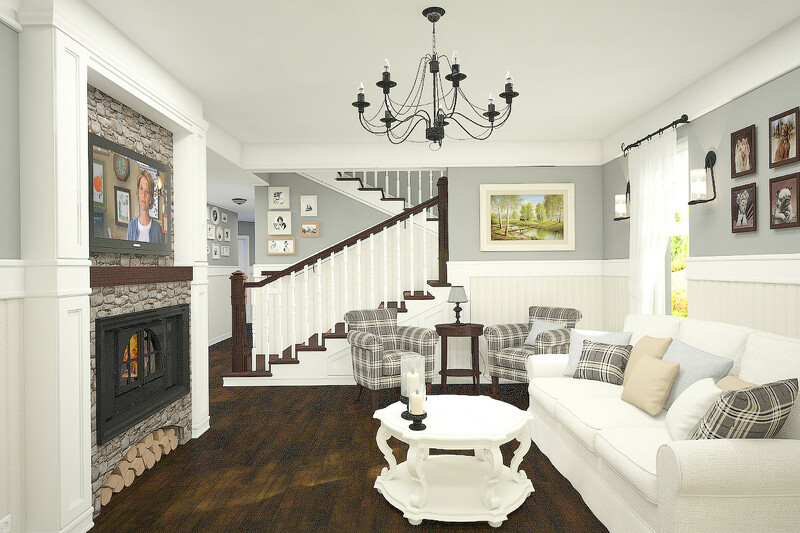 White color is also used for doors and furniture, as well as stair balusters and tulleys, it is very refreshing to the interior and creates a beautiful contrast with the dark brown color of the floors, steps and the ladder of the stairs.